the R Series can be used economically in an extremely wide variety of applications from small pv systems in developing countries, mobile and marine applications to large scale renewable energy power generators, uninterruptible power supplies for large buildings and anywhere pure, reliable AC power is required. high efficiency even at light loads. unique modular system allows simple paralleling to increase system capacity as user requirements grow. Sustain's intelligent control system ensures even large systems can achieve unprecedented efficiency levels at light loads. configurable for single or three phase outputs. low zero load power draw. low sleep mode power draw. unrivaled in its ability to deliver heavy start up currents with peak power outputs of up to 240% of nominal. virtually indestructible output circuits able to withstand indefinite overloads. automatic input over-voltage and reverse-voltage protection means no blown fuses. automatic low battery shutdown with adjustable level. lightweight compact design only 5kg. robust and simple connector system. conventional large capacity stud connections also available (S suffix). volt-free alarm output and low voltage warning. remote output control and low battery warning via a low cost simple remote unit (SR100). popular settings programmable using internal DIP switch for immediate use. comprehensive control of settings, metering and remote data logging can be achieved by adding an FPD Power Management Unit (PMU100) or serial adaptor (SA100). A two level security facility prevents unauthorised tampering. designed from the outset to meet the needs of the renewable energy industry. all circuits have conformal coating for tropical and marine applications. exceeds the highest international standards for safety, emc and reliability. 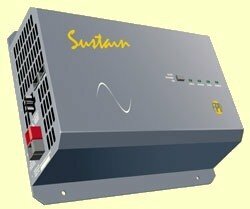 Sustain a unique range of innovative, modular, stand alone sinewave inverters designed by FPD in consultation with power system installers and end users across a wide range of industries to meet a diverse range of inverter needs.